July | 2014 | What Makes That Black? Friday night– Santa Rosa, California. I’m standing in a Lindy-Hop dance class with thirty plus people of various cultures, mostly European American. We are partnered and standing in a large circle around the periphery of the room, all of us listening to an excited teacher as he directs the followers. “You just need to follow your partners, they will put you where you need to be.” We dance for another four minutes and I’m not getting to the place, “where I need to be”. We dance for another five minutes and I eventually “figure-out” my own body alignments that accompany the lead from my inept partner. However, the teacher, along with the Lindy hopper I’m dancing with – bless his soul – are getting on my last nerve. I had danced swing for years as a child with my mother, so I know the basics of the dance form; I am in the class to experience something else, “participatory following”. I am an Aries, assertive, first-born, Type–A, perfectionist … a black woman who is now tired of that 24/7/365 role. I am in the Lindy-Hop class to become practiced at following. But so far, it isn’t happenin’, at least not with this partner … in this class … with this teacher. How should I say this … black women tend to be a “dialogic and participatory” breed, consequently the men and women of the Harlem Renaissance created the dance. Swing dancer Norma Miller said, “We busted our buns to create that” … she didn’t say George “Shorty” Snowden, Leroy Stretch Jones or Frankie Manning alone busted buns. However, I quiet the “what’s up with the male dominance” thinking. Simply because I know it will get-in-the-way of my learning, and more importantly, my following. I watch the teacher demonstrate the second half of the pattern; his manner was bouncy and sun-shine excited. “This is so un-black”, leaked across my lips. I know the Lindy to be a dance of extreme synergy between five entities – the dance itself, the two dancers, the music and the earth, all flying at breakneck speed from a low center of gravity– reflecting the spiritual forces coming from underneath the ground. Within milliseconds my research streams across my mind. The Lindy moved into cultural spaces where God lived in ascension and aesthetic of the cool was symmetrical and held. During the early 1900s America was, yet again, looking for a new identity and it found the music and dances of the African American. But, in America, these Africanist cultural products had to be removed from its source. These dances were a rich source for transforming the symmetrical, the prearranged, the tradition and the fixed of European-American culture…but not too much. I remembered Jayna Brown’s book, Babylon Girls: Black Women Performers and the Shaping of the Modern. … black expressive forms, miscoded as signatures for a timed and timeless past and separated from actual black subjects, were used as the source by which the modern (white) body could re-member itself. So, here I am, in a class of predominately European Americans – who are trying to ‘re-member’ themselves, with an effervescent white teacher – who is using a European-American teaching modality, in a European-American setting–the classroom, attempting to learn a black dance that had been forged in the nightclubs of Harlem. Needless to say on so many levels it is not working. I move on. Saturday afternoon– San Francisco, California. I am standing in a private salsa lesson as the teacher explains how the follower should press through the first metatarsal on count-five; then, on count-six roll through the metatarsals of the foot toward the baby toe as the weight shifts to the back leg. Aside from the fact that the teacher looks fabulous doing it, I’m thinking, “Do they really engage this metatarsal action in Cuba, or in the salsa clubs in Florida and New York?” and do the club salseras always wrap the leaders deltoid between her thumb and index finger of her left arm as it rests on his, elbow to elbow? Again, I have to release the questioning thoughts so I can learn the technique. Years later I’m still with salsa, following, and loving it. The ecstasy of trusting and being led into virtuosity by my partner, the music and the clave has no words – I truly have Zen-bliss every time I am on the salsa floor. However, I have had some unexpected exercises along the learning path, like holding the long side of a hanger against my ribs below my breasts as an indicator of my ribcage inappropriately moving as I step through the basic. It seems natural to move my ribs a little, but apparently I’m not supposed to allow them to respond to the movement of my hips, unless I am dancing Cuban Son or other such variations. I decided to withhold my questioning, and made friends with the hanger. I continue to mutter to myself as I stand from the sofa and turn on the computer. After an hour of several sites and a few phone calls to other dance scholars. It really was, at one time, a swing-form birthed in the African-American aesthetic and had traveled to Europe via of the Black soldiers of World War II. At that point the dance was guided through a Western-European classical sieve, removing many of the Africanist structures. 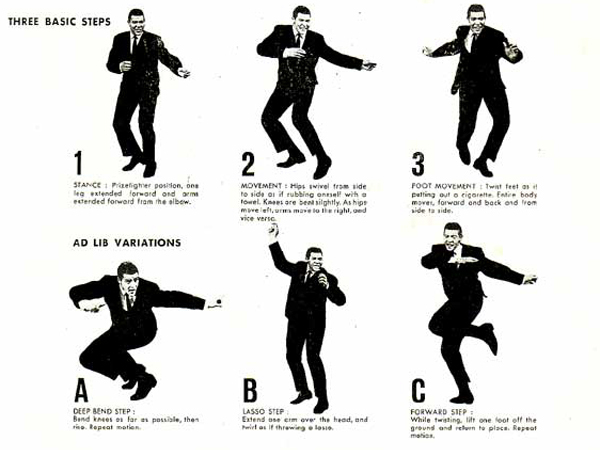 Chubby Checker demonstrating the three movements of the twist. I suggest that the Waltz Aesthetic can be seen as a kind of racial project, using dance as a means of restricting African American agency and legitimacy in cultural production. Praise his doctoral heart. I needed Dr. Martin’s words years prior, as I stood with my sweaty-palmed Lindy-Hop partner. As dancers we are usually oblivious to the politics and cultural dynamics of the dances we study. This is why I research…this is why I write.